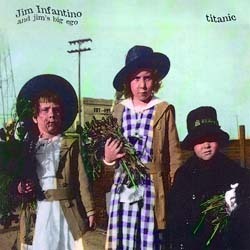 Jim Infantino and Jim's Big Ego "Titanic"
For several years Jim Infantino has been one of the most talked-about up-and-coming singer/songwriters in the country. With Titanic's unusual blend of solo songs, band performances, folk, rock, rap, and word jazz, Infantino has carved his own niche as a trailblazer, leaving more traditional songwriters in the dust. This 70-minute CD is the first live release from Jim, who was named 1995 "Artist of the Year" by the National Academy of Songwriters.